Polls are once again set to be postponed, delaying the country’s return to civilian, democratic rule. Promises from Thailand’s ruling junta to return the country to civilian leadership and democracy via an election have remained unfulfilled in recent years after a string of delays and excuses. In December, a plan to have the country at the polls by the end of 2018 offered a brief moment of hope after Prime Minister Prayut Chan-o-cha took small steps towards reversing a ban on political activity introduced when the junta took over in a coup in 2014. Now, for even the most optimistic of Thai politics watchers, the illusion of a 2018 poll has been all but laid to rest. A change to election laws last week will see the election date pushed back to early 2019, Deputy Prime Minister Wissanu Krea-ngam said, telling media in Bangkok the country can expect to vote in January or February next year instead. The law regards the election of the lower house and is one of four necessary to holding elections. But local media reports that the bill had recently been changed by military lawmakers to include a clause stipulating a 90 day delay before enactment. That, alongside the required 150 day waiting period it takes for electoral laws to come into effect, will push the first available date into the new year. It is widely speculated the delay is motivated by the junta’s quest for more time to cement its stranglehold over the Thai political landscape and consolidate its power as it scrambles to respond to a deepening corruption scandal and pro-junta parties get their houses in order. Deputy Prime Minister Prawit Wongsuwan recently became the focus of an Internet-based investigation in December, after revealing a wrist heavy with a Richard Mille watch, believed to be worth some $90,000. Soon, a Facebook page based in Los Angeles linked Prawit to 25 luxury watches with a combined worth of over $1 million – none of which appear on his personal assets disclosure. Prawit has not been particularly forthcoming with reporters and investigators, saying he does not remember where the watches came from. His dismissal of the scandal has furthered distrust in the junta and undermines efforts to present itself as a clean alternative to the scandal-plagued Puea Thai Party, which was in power when the coup took place in May 2014. The case has captivated Bangkok media and netizens alike. The junta is keen to control the story but, as the recent resignation of pollster Arnond Sakworawich from a university in the capital revealed, the electorate is furious. According to Sakworawich, who resigned after being allegedly told to keep the results hidden, 80 percent of respondents do not believe Prawit’s laughable line of not being able to recall where the watches came from. 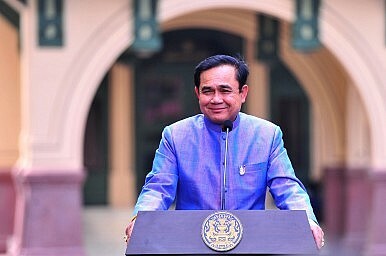 Prawit is well-connected within the military and the parliament, which contributes to the sense of his untouchability. But, for Prayuth, who increasingly looks to be vying for an election win and staying on as prime minister, this presents a complicated problem. How does he reprimand his recalcitrant deputy and weather the increasingly farcical storm without upsetting the powerful figure? It is a big question, but he has found himself more time to get the answer. Commentators have suggested the delay will be used to put together a pro-junta party, with Prayut at the top, and develop a political brand more palatable to a democratic election. This is important because it would render an election virtually meaningless even if and when it does occur. Prayut, for his part, has denied having a hand in the delay, instead pointing to last year’s constitutional changes. For democracy activists, further delays build pressure. Protests on Saturday saw activists demand Prayut honor promises of a poll, a rare move in Thailand where protests are still tightly controlled. The group has said it will hold further demonstrations this month if the junta continues to ignore its concerns.